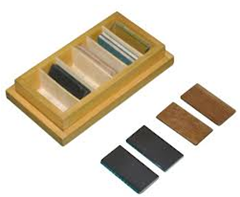 A box divided into four sections containing two tablets each made of felt, wood, steel and slate. 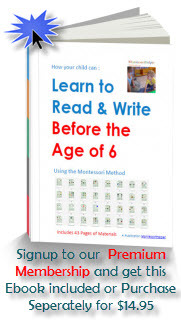 To help awaken the child’s sense of time. To give the child a sense of the cosmic approach. The days are torn off. The child sees the calendar getting “thinner” throughout the year. While keeping her left hand remaining on the piece of tablet, she uses her right hand to feel the tablets on side B, one at a time to find the matching piece of tablet. The matched tablets are then placed together side by side in the middle between the two columns of tablets. The Directress continues in this manner until all the tablets are matched.